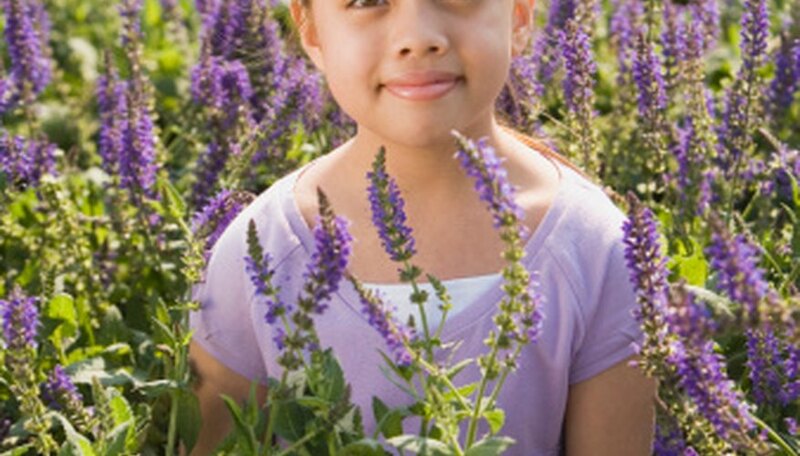 Grow lavender seeds in USDA zones 4 through 7, where the average minimum temperature range does not drop below negative 30 degrees F or above 10 degrees F. These hardy plants grow even in stony or slightly sandy soil. The most common and easiest way to propagate lavender is by replanting heel cuttings from mature lavender plants, according to the “Complete Guide to Plants and Flowers.” However, you can also plant and grow lavender from seeds. Plant the seeds in well-drained soil about 1/2 to 1 inch beneath the surface. The soil does not need to be nutrient-rich, but it must be moist. Do not over-saturate and make the soil muddy. Prune any nearby trees to allow for adequate light. Lavender plants require full sunlight, and they grow best in open fields without any shade. Even moderate shade can hinder growth. Water as needed to ensure soil moisture during germination. Lavender plants germinate in 14 to 25 days. Once the seedlings have sprouted, ensure adequate moisture, although it's not as essential. Lavender plants thrive even in arid environments. Pull out weeds from the area around the sprouting lavender on a daily basis during the spring and summer. Weeds consume water and nutrients that could go toward lavender growth. Cut away dead stems in autumn, as is recommended for lavender by the American Horticultural Society. If you leave dead organic matter in your lavender garden over the wintertime, it hinders regrowth in the spring. Dig up your lavender plants and move them to indoor pots if you anticipate winter temperatures reaching below 30 degrees F. After one growing season, your lavender seeds will have matured, but they will not return the next season if the temperature gets too cold.